A former athlete from Cardiff is running the London Marathon for Diabetes UK Cymru to support three close family members with the condition. Jezzelle Lobeck, 29, an events manager, has represented Wales internationally as a triathlete and cross country runner at junior and senior levels, and has completed the Cardiff Half Marathon twice. However, Jezzelle says facing the challenge of her first marathon is nothing compared to the challenges her family members with diabetes face every day. 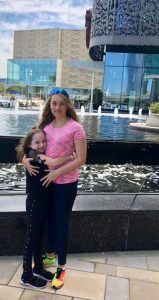 Jezzelle said, “My cousin Malaika was diagnosed with Type 1 diabetes in April 2016, just after her sixth birthday. It was a very scary time for all our family as there was so much to learn and if not managed properly the condition can be life-threatening. “We’re all so proud of how Malaika has adapted to life with diabetes. Within a week she was injecting insulin herself. It can be hard sometimes, but Malaika tries her best not to let her diabetes slow her down and continues to lead a normal life doing her favourite sports and activities. “Our family had another shock just a few weeks ago, when my cousin Duke, 23, was also diagnosed with Type 1 diabetes. Luckily, his symptoms were spotted early and like Malaika, he has taken it all in his stride. As well as this, Jezzelle’s aunt Diana was diagnosed with Type 2 diabetes 10 years ago. All three of them are positive about managing their condition, and eat healthily and exercise. Her family’s strength and resilience inspired Jezzelle to support Diabetes UK Cymru with her first ever marathon on Sunday 22 April. Jezzelle continued, “Malaika, Duke and Diana have all overcome difficult challenges and their courage and determination inspired me to sign up to the marathon. It’s hard to motivate myself sometimes but my mindset changes when I think of the people I’m running for. Joseph Cuff, Fundraising Manager, Diabetes UK Cymru, said: “As Jezzelle and her family know all too well, diabetes is a complex condition that must be managed carefully day-to-day.. It can be challenging sometimes, but having the support of family and friends can make a real difference. Find out more about Diabetes UK Cymru at www.diabetes.org.uk/In_Your_Area/Wales .